Stop in at Alki Bakery for some good food right on the beach. Alki Bakery is just one of the many places to grab a bite to eat when visiting Alki Beach. 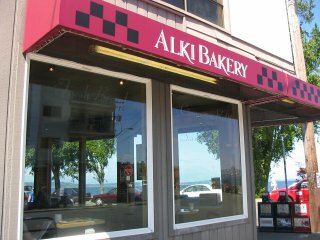 There are a number of restaurants/places to eat along Alki Beach, but there is only one Alki Bakery. We all know that Seattle is well-known for its coffee houses and shops, but in an era of Starbucks and Tully's, it's nice to find a place with its own feel and attitude. So what's so good about the bakery on Alki Beach? Well, the first is just that... the bakery is located right on the beach and so the views are fantastic. You can choose to eat either inside or outside, but no matter where you choose to sit, you'll most likely be able to find a place with a nice view of the water and the events on the beach. 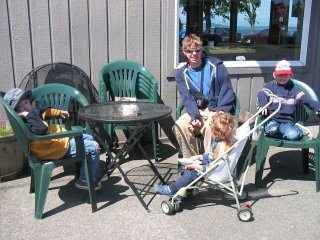 The last time we stopped by Alki Bakery, it was a little chilly outside so there wasn't too much happening on the beach, but the sun was shining and so we still decided to eat outside and enjoy the sights and smells a little more. First of all, the place is (obviously) a bakery so if you're going to go, I'd suggest you head there in the morning for some of their delicious muffins or cookies. However, if you go with someone else, or with your family, at least one person in the group needs to order the cinnamon roll. The Alki beach bakery is famous for its cinnamon rolls and they haven't disappointed any time we've ever gone there. I'm a big cinnamon roll fan and the ones I had here have to be in the top tier on my list. So make sure you try at least a bite (if that's even possible). The bakery also has other types of food available, but I've never tried anything else besides the bakery items so I couldn't tell you if they're good or not. There are a lot of regulars that come into the bakery on a daily or weekly basis, so as a tourist in Seattle, going to the bakery feels like you're experiencing something a little more native to the region, which is what traveling is all about. So next time you're visiting seattle or Alki Beach, make sure you head over to the bakery and grab yourself something to eat. You won't be disappointed. Back from the Alki Bakery.